It’s Thanksgiving day, do you know what you’re having for dinner? If not, or for some reason your plans changed, I have a fun and easy dish you can make without going to the store. This is the last minute Thanksgiving main course of your dreams! Also if you’re reading this after your dinner and have leftover mashed potatoes this is a perfect use for them. 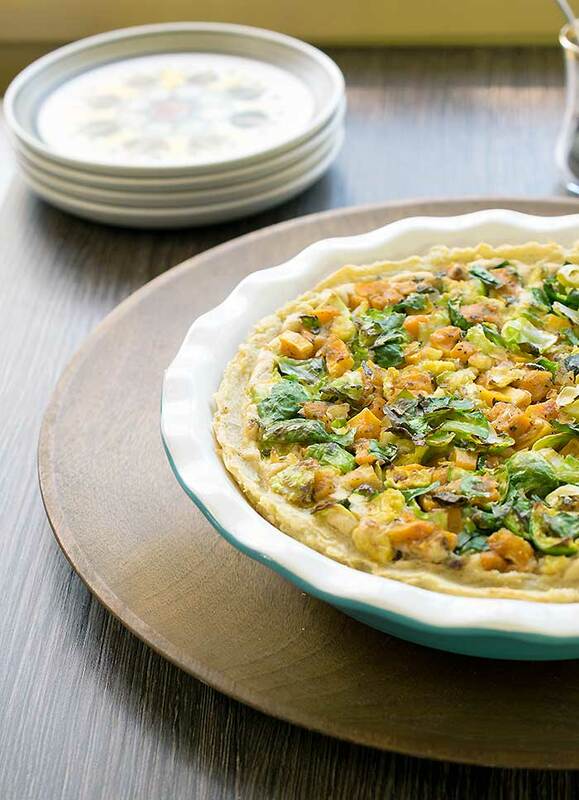 For this Mashed Potato Crusted Butternut Squash, Brussels Sprouts, and Tofu Pie you’ll need potatoes, butternut squash (or sub another orange vegetable like carrots), Brussels sprouts (or another green veggie like kale), and a container of silken tofu in your pantry. This is another in my series of posts sponsored by the Idaho Potato Commission. I love potatoes and they make a great pie crust. What a versatile veggie! Next, you make the tofu custard, pour it into the baked crust, and place the vegetable mixture on top. Bake the whole thing and you have your whole dinner right there in one little pie. 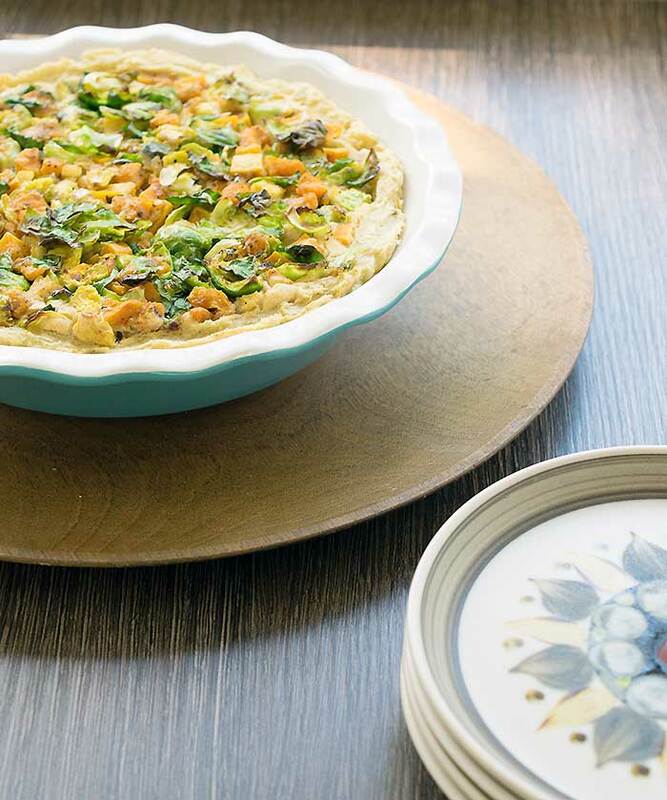 This fun pie is the perfect dish to bring with you to a Thanksgiving gathering. 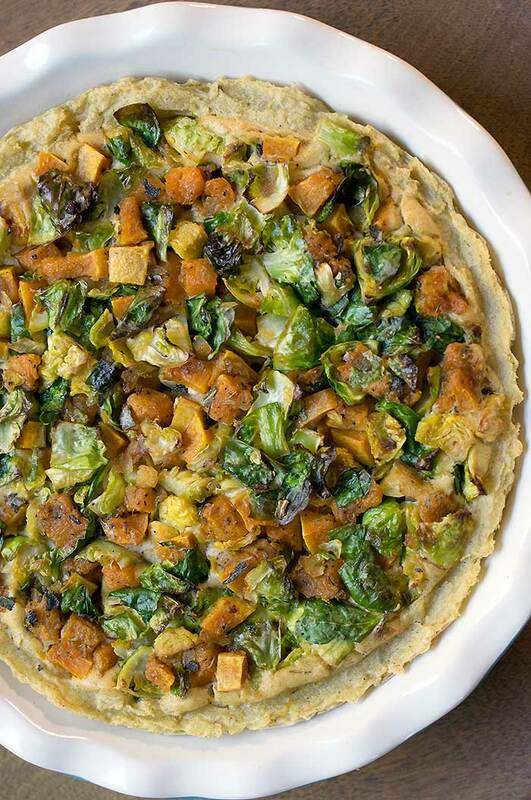 Nestled on a crust of mashed potatoes is a creamy tofu filling that’s studded with pieces of butternut squash and Brussels sprouts. It’s a show stealer! Preheat your oven to 350 degrees, line a small baking sheet with parchment paper, and oil a 9-inch pie pan. Toss the butternut squash, olive oil (if using), and sage, with salt and pepper. Spread onto prepared baking sheet and cook 15 to 20 minutes or until soft. Stir at least once while cooking. Mash the cooked Idaho® Potatoes, nutritional yeast, salt, and pepper together with a potato masher or a large fork. If the potatoes are too dry to mash properly, add water a tablespoon at a time until the mixture is creamy. Spread the mashed potato mixture into your pie pan. Make the side walls of the crust fairly thick and bring them up to the top of the pan. Then use a spatula to even out the bottom of the crust. Bake the crust for 30 to 35 minutes, until it just begins to brown. If the crust puffs up, you can just press it down with a spatula. Heat the olive oil in a medium saute pan and saute the onion until translucent. Then add the Brussels sprouts and sage and saute another 5 minutes, until the sprouts begin to soften. Set aside. Add all the tofu filling ingredients to your blender and blend until smooth. Spread the filling over the baked mashed potato crust. 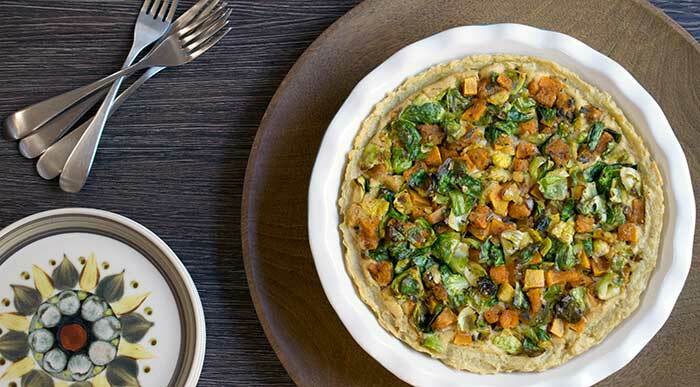 Carefully mix the roasted butternut squash with the sauteed Brussels sprouts. Using a large spoon, evenly distribute the veggies on top of the tofu filling. Press the veggies into the filling just enough to keep them anchored. Bake for 35 to 40 minutes or until the tofu filling is set. Made this last minute when noted that we had all that was needed, and so happy I did. Ended up roasting the brussel sprouts and onion with the butternut to save a pan, and loved the results. Also added some S&P to the tofu batter. I’m thrilled that you liked it! This looks so good. We grew butternut squash this summer and have plenty left, so we are going to try this recipe in the next few days. Thanks for sharing. This was really delicious! I did have one question, it seemed to take me a long time to prepare, is there any steps of this recipe I could do ahead? I would love to have this more often, but I don’t normally have this much time to make it. Can this be prepared ahead (say a day), refrigerated and reheated? This looks so good! Am thinking of making it for a Thanksgiving gathering. I have a hard time to peel Raw swuashDo you think the squash could be backed and spread over the tofu and then just add the other ingredients? Kathy! This pie has so many of my favorite things in it! I need to make it for my family, for sure. This looks incredible! It would be perfect for Christmas dinner, too!